Not to belabor a point, but I wanted to give yet another example to refute various commenters to this site who claim that instead of Western media generally being anti-Israeli, that it is anti-Arab/Muslim. Here is a beauty of a BBC article. Besides the obvious underlying problem that BBC gives credence to anti-Israel viewpoints by choosing to publish such slanted articles, the title itself reveals their opinion. "Jerusalem crash 'not deliberate'; Relatives of a Palestinian who was shot dead after his car ploughed into a group of Israelis at a bus stop have denied it was a deliberate attack." In case you don't feel like reading the article, let me just say that they validated as indisputable fact one side of a highly volatile disagreement, whether or not East Jerusalem is "occupied" or not - and did so twice. Guess which side they sided with. And that's just the most obvious bias. I promise this is the last time I'll talk about media bias against Israel for a long time. Oh, before you leave, look at that picture again and just internalize the unbalanced implication of making that the lead picture for the piece: young boy holding a picture of the attacker, presumably a younger brother, with women crying in the background. I'm shaking my head. I'm sorry to say that bigot blinds you my friend. Why can't you try to listen sometimes, try to believe instead of rejecting everything coming from your neighbours as false and vile. If an Israeli had made the same crash you would have read it in the last page of your Jerusalem Post, and awarded no importance to it. But Palestinians having car accidents in Israeli neighbourhoods, in your twisted mind, evidently equals terrorism. Let me tell you one thing, if you're looking for suicide terrorists, don't look at rich palestinians driving BMWs. Lastly, what is so wrong about relatives mourning the death of a son, brother... well a human being for God's sake. Why does that make you 'shake your head'. I hope your family will mourn you the day your life evades, or then I will know why you are so angry. Why just today, Dom, I took a long walk around East Jerusalem, around the neighborhood where one of the most recent terrorists came from. I do open my eyes, my friend. I see everything - I read everything - I objectively see the side I believe in as being correct in this matter... and I do understand and sympathize with certain points presented by the other side. If an Israeli killed Arabs on purpose, I'd be outraged. It happens, yes. I remember being here in 2005 when an Israeli kid went nuts, went into an Arab area, boarded a bus with his gun, and killed people. He was killed by those on board. I was DISGUSTED at his actions. The entire country was very PISSED off at that. If you had the perspective of living here, you would have known that. But you don't live here, you don't see Arabs and Jews alongside each other every day. You don't see how we in fact DO coexist... and when any individual wrongfully kills an innocent, THAT is terrorism. 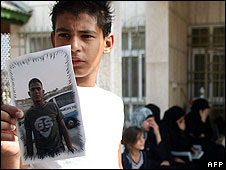 That Israeli committed terrorism that day, and we condemned him angrily. Don't tell me that I am blinded when it is in fact YOU who only sees one side of this argument. They can mourn the boy, yes, but they are denying that he did this on purpose. I'm sorry to disappoint you... he did it on purpose. His track record says yes, the circumstance of him being in a VERY bad mood says yes, and the fact that he gunned the car into the crowd certainly says YES! Am I blinded? I certainly saw the security fence crystal clear TODAY.